State of Innovation – Let's Go Be Great! 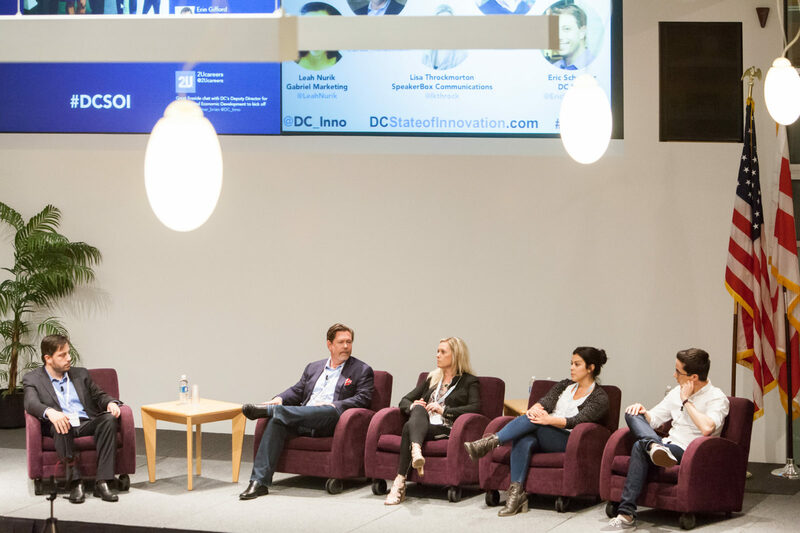 DC Inno’s annual State of Innovation event brings together local business leaders, entrepreneurs and innovators to examine trends in innovation. This year’s event featured prominent speakers and panelists from thriving local companies, interactive roundtables with startup executives sharing their stories and advice, networking and a live recording of the DC Inno Beat Podcast. The first panel of the day was Sell and Tell: Marketing and PR. Moderated by DC Inno staff reporter Eric Schwartz, the panel focused on the evolving needs and strategies of marketing and PR in the world of tech and startups. Brad Heidemann of Tahzoo emphasized the importance of knowing who you’re targeting as potential clients while Lisa Throckmorton of SpeakerboxPR laid out the importance of knowing the media you’re pitching to. Leah Nurik of Gabriel Marketing shared her ideas on how creativity can impact public relations and marketing and Allen Gannett from TrackMaven highlighted the importance of data and importantly, using the data, when designing marketing plans.